When talking about WordPress, the best blogging platform, with bloggers who have already spent a few years writing, creating WordPress posts might sound trivial. The truth is that you can publish your first post very quickly. But if you want to do it the right way, there are things you should explore from the start. Let us help you with that. Although both WordPress editors (visual and text) look quite intuitive, sometimes even more experienced users can get in trouble. Just sometimes, even if you have published dozens of articles, you won’t be able to find that particular feature you needed for the post. On other occasions, you’ll get surprised to find an option that was sitting in front of you all the time. If just learned how to start a WordPress blog and you’re about to start writing your first WordPress post, you are in the right place. In this article, we are going to show you everything that’s available on the post screen. After logging into WordPress, take a look at the left side of the screen. On the admin menu, there is the Post menu item just under the Dashboard one. To start writing your first post, hover your mouse cursor (or click) on Post item. Then select “Add New”. Alternatively, you can create a new post by selecting New -> Post from the admin bar. Either option will take you to another page which allows you to write and edit your first article. The first element on the new page is a post title. Without any particular options, here you will have to write the title of your article. Technically, it is possible to leave this field empty, but in that case, WordPress will automatically add “(no title)” attribute as your headline. Just from a user experience point of view, we advise that you always write a custom title for any post that you’re about to publish. As soon as you write a title and switch focus on the content box, Permalink Settings will appear below the title field. If you haven’t changed anything to your permalink structure, this will just help you see the exact URL to your new post. If you copy this URL, you can send it to your friends, post on social media or use anywhere else to get direct access to the post once you publish it. In case you do have a custom permalink structure, clicking the “edit” button next to it allows you to change the last part of the permalink to anything you like. Below the title field, the content box awaits for your input. This is the area where you should write your first WordPress post. Depending on the editor, things can look a bit more different. In the following segment, we’re about to show you all the elements available on the page. The visual editor is more beginner-friendly. 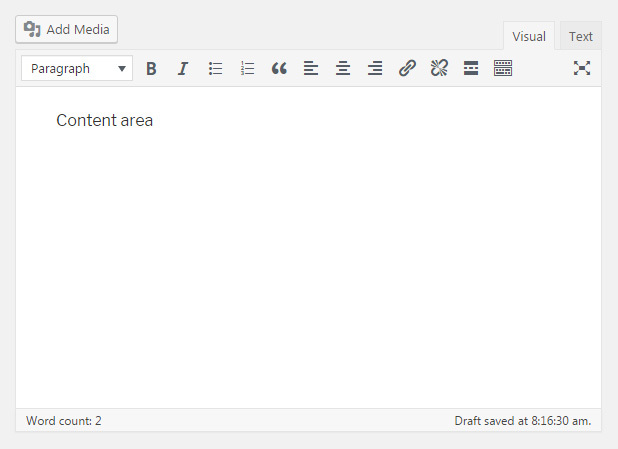 It lets you focus on the content and use formatting buttons to style text just like with any word processors. On the other hand, the text editor is more developer-friendly. It empowers you to write and add code directly from the editor. While switching between editors is possible just by selecting the right tab from the right side of the content area, it’s not advised to do so. Changing editors might mess up your formatting. 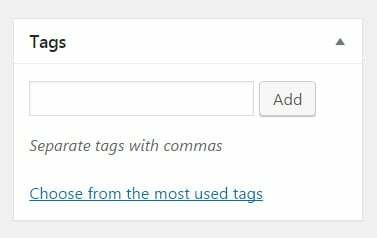 For example, if you create a numbered list in the text editor and then switch to a visual one, WordPress will jumble up the list by adding additional HTML tags. If you have no experience with HTML, we suggest that you stick with the visual editor. When working in any of the editors, you can use keyboard shortcuts to work faster and more efficiently. For example, press CTRL + B key combination to make selected text bold. Although it is not possible to shut down the text editor, you can easily turn off the visual one. To do so, please navigate to Users -> Your Profile which will open your profile settings page. Under Personal Options, select the first “Disable the visual editor when writing” option. Don’t forget to scroll down and click the Update Profile button to save changes. Now, you will only have the text editor, and you won’t have to worry about switching through editors by mistake. While writing your new article, you should not worry about losing your content. By default, WordPress automatically saves the entire post content for you every 60 seconds. Just in case you forget to save the progress manually, it’s good to know that WordPress got your back. On top of the content area (and just below title), click the big “Add Media” button to open Media Library. Here you can select previously uploaded images, add new ones, create galleries and so much more. On the right-hand side of the post screen, several publishing options are waiting for your action. Let’s take a closer look at all the options you get to work with. 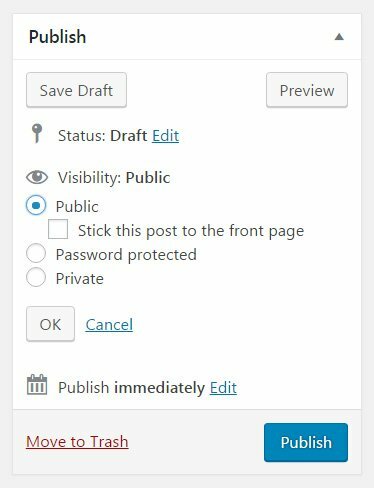 If you click on the Save Draft button, WordPress will save everything you’ve done so far on the page. 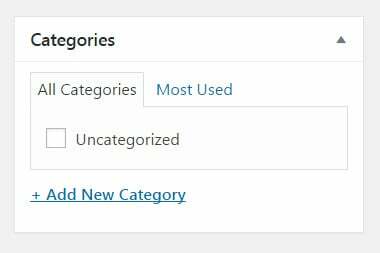 That includes the content and everything around it that you filled in or selected (like categories, tags, and so on). The preview button opens a new tab or window in your browser, and it shows you what does your article look like at the current stage. This is what the post would look like to everyone if you were about to publish it. Please take note that the URL of a preview is different than the originally published post. Also, the preview link will not work for non-logged in users. Even though it is possible to make previews available for public, you will have to install additional plugins for that to work. 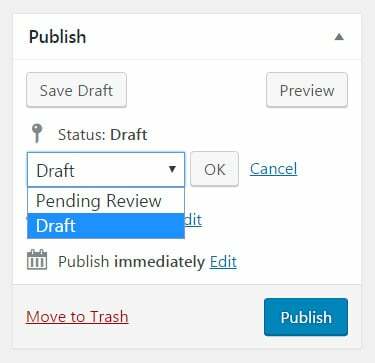 While still working on your article, by default, the status will be set to draft. By changing the status to “Pending review”, you can tell your coworkers that you have finished working on the post and allow editors to review and approve it. Changing statuses is a must-have feature when working in a team. Once you publish a post, the status will automatically change to “Published”. It is possible to alter the status of the already published posts from here, so you can even unpublish a post if you want to. Your new post can have three different visibility statuses. Public – allow everyone to see your new article. If you check the option to stick the post to the front page, that particular post will always appear on top of your blog list. This is also known as a sticky post. Password Protected – enter a password for the post. Only people who enter the correct password will be able to see the contents of the article. Private – If you privately publish the post, only users who are logged in and have editing privileges will be able to see it. 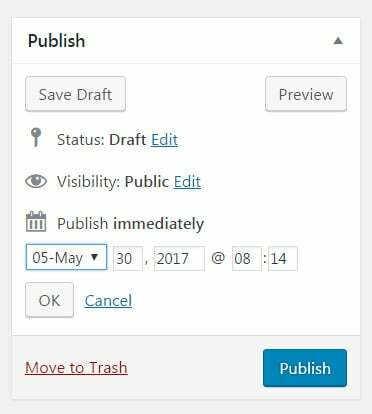 By default, WordPress sets all posts to be published immediately. By clicking the “Edit” link next to this option, an article can be scheduled for publishing or set to any date in the past. If you decide to delete the post that you’re currently editing, just click the “Move to trash” option. If you click the link by mistake, don’t worry; WordPress allows you to undo changes from the next screen. Also, your post will stay in the trash for 30 days. During that period you can always choose to bring it back to life or permanently delete to keep things neat. 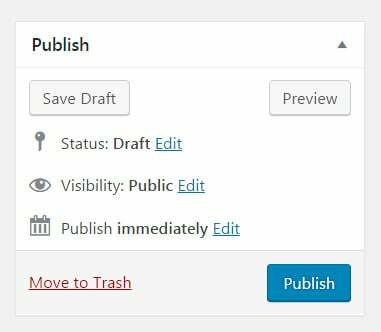 Lastly, there’s the blue “Publish” button that makes your post public. By default, clicking the button will make your post live instantaneously, and everyone will be able to see it. But if you click the “Edit” link next to the button, you can schedule or create a backdated post. By default, WordPress allows ten different post formats to be used by any theme. Depending on the theme you have installed, you may have all ten, none, or anything in between. Those formats allow you to change the layout of your post. Although the post would be displayed differently by changing a format, the content would stay the same. Add your new post to a category that you have previously created or generate a new one by clicking the link below the list. You can choose a category from the list or view the most used ones. A featured image (also known as post thumbnail) is one picture that will represent your post. In the past, only some themes allowed this option. Today, almost all WordPress themes support featured images. Depending on the WordPress theme you use, a featured image will appear on top of your post after you publish it. It will also show on your homepage, blogroll, and other places where your theme displays posts. To insert a featured image for the post, click “Set featured image” link. From this new window, select a picture that you’ve already uploaded, or add a new one from your computer. At this point, it may seem that we’re done with all options available on the post screen. But if you scroll all the way up, you will see a Screen Options tab. By clicking on it, a few options will drop from the top of your page. By default, Format, Categories, Tags, and Featured Image boxes are already selected. As you can see, those are the ones that we just went through together. But a few more boxes still sit empty. If you check them, new options will appear below your content editor. Let’s quickly see all the options and what they can do for you. Excerpts are short summaries that you need to write manually. Depending on the theme you use, you can display excerpts on your homepage where you show all the latest posts. If you don’t use these manually written excerpts, WordPress will automatically take a first few sentences of your post to create an extract from it when and where needed. If you enter URLs of websites in this field, WordPress will send them a notification. This way, the admins will know that you linked to their sites from that particular post. If you are linking to another WordPress site, you don’t have to do anything – WordPress will automatically send a pingback to linked blog and make the same notification. Since trackbacks and pingbacks are often misused for spam, many bloggers turn them off altogether. So, if you decide to send a trackback, don’t be surprised if that user never receives it. Sometimes, WordPress themes might use custom fields to allow a few extra information to be added to the post. Depending on a theme you use, there may be dozens of available custom fields. 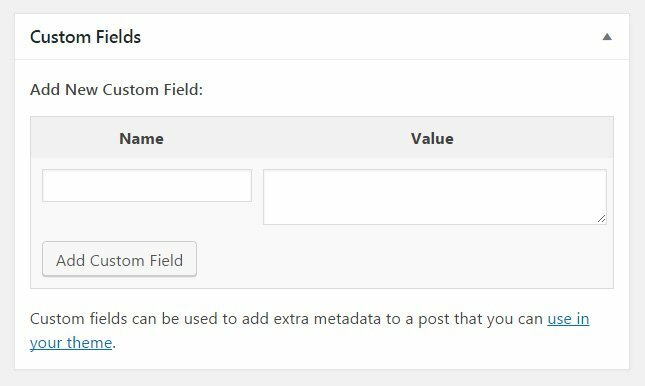 Since custom fields can be programmed to do practically anything with your post, they can simply add extra information to describe it, or they can change it completely. For example, if you are using a professional theme designed for the food blog, you might be able to add a custom field that will show a menu or a recipe on that specific post only. By default, WordPress allows comments on each one of your posts. But if you want to turn off comments just for that one post, this is the place to uncheck the option. You can also disable trackbacks and pingbacks here. A slug is the part of the URL that you can edit. It is the same option that shows under the title. If this is your first post, the chances are that you only have one user account – your own one. But sometime in the future when you might have more than one account, this is the place to switch the author of a post. WordPress will automatically select your account as the author of the article, but if you want to change that, just select a new user from the list. After choosing boxes which you want to have on the post screen, the layout allows you to show them in 1 or 2 columns. We suggest that you try both of the options to see which one suits you better. In case you decide to go with just one column, please take note that everything that was by default on the right side of the screen will now appear bellow content editor. By placing the cursor over the upper part of any box, you will be able to drag&drop the entire section to another available location. By moving elements, you can reorganize the whole layout. The screen options tab allows you to disable full-height editor and distraction-free functionality. By default, they will be turned on so that you can resize content area, and allow distraction-free functionality which opens the editor in full-screen while hiding all the other options. You should know that it is possible to extend options and features of the post screen by installing additional plugins. More often than not, a theme will already have custom boxes and features. So, even if you’re just starting, you may have some extra options on this screen that are unique to your site. Don’t be scared to explore them. Although there are quite a few choices and elements to control when writing a new post, we hope that the amount of them haven’t scared you away. After going through this article, you will just need to start writing. After a few successfully created and published articles, you will be able to customize your working area, and you will be faster with each new post that you add.